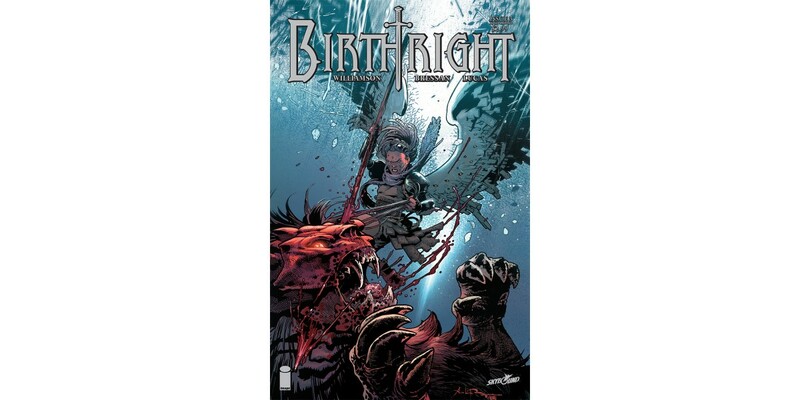 Writer Joshua Williamson (NAILBITER, GHOSTED), artist Andrei Bressan, and colorist Adriano Lucas’ bestselling Skybound series BIRTHRIGHT grows in readership and praise as the story’s plot twists continue the epic fantasy ride. BIRTHRIGHT #3 is being fast fast-tracked to a second printing in order to meet customer demand. In BIRTHRIGHT #3—after a standoff in the police station—the Rhodes family is on the run from the law, and for their lives. And just what horrors did Mikey survive while he was away? BIRTHRIGHT #3 remains available for purchase across all digital platforms, including the Image Comics website (imagecomics.com), the official Image Comics iOS app, Comixology’s website (comixology.com), iOS, Android, and Google Play. BIRTHRIGHT #3, 2nd printing arrives in stores on 1/28 and can be pre-ordered with Diamond Code NOV148198. BIRTHRIGHT #4 hits stands on 1/7 and can be ordered with Diamond Code NOV140642.